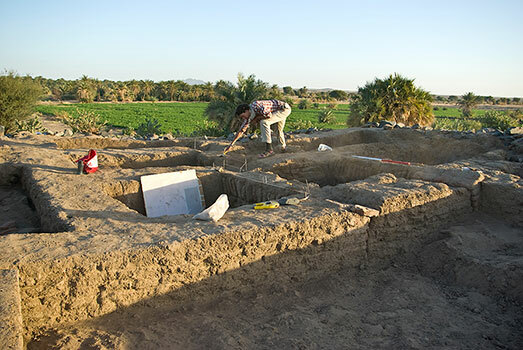 The first campaign of the joint SARS-British Museum project at Kurgus investigated the Hagar el-Merwa in detail, surveyed the archaeological sites in the vicinity and undertook small-scale excavations within the mud-brick fort on the river bank and in the cemetery. 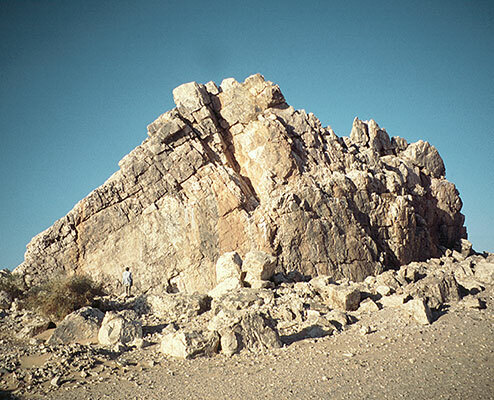 The Hagar el-Merwa is a white quartz outcrop which dominates the right bank of the Nile 40km upstream of the Nile bend at Abu Hamed. Carved and painted on the Hagar are many inscriptions of the Egyptian New Kingdom including two boundary stelae of the pharaohs, Thutmose I and his grandson, Thutmose III. 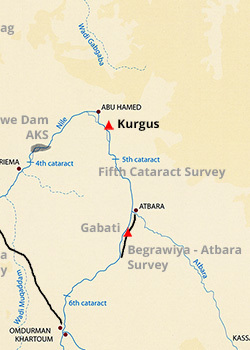 This was the southern limit of the Ancient Egyptian Empire on the Nile. The current campaign is focused on the fort and cemetery. The fort, which dates to the medieval period, measures approx. 72m square and is defended by massive walls 5m thick from which project towers at the angles and midway along each side. 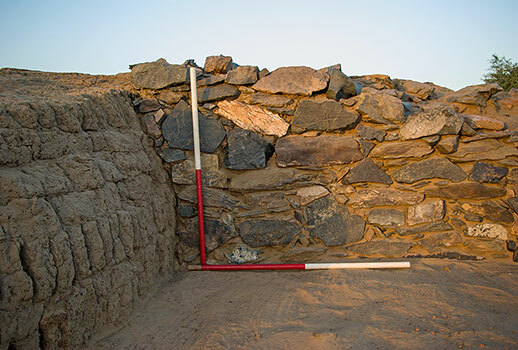 Recent excavations have focused on the north-west angle tower revealing many different phases as the tower was extended and remodeled. The remains are well preserved with the west curtain wall surviving to a height of over 1m by the arched gateway which was later blocked. Limited clearance within the fort indicated that there were extensive remains of buildings much disturbed by robber pits dug to carry off the mud bricks and archaeological deposits, which in the past, have been spread on the fields by local farmers. In the cemetery, which covers an area approx. 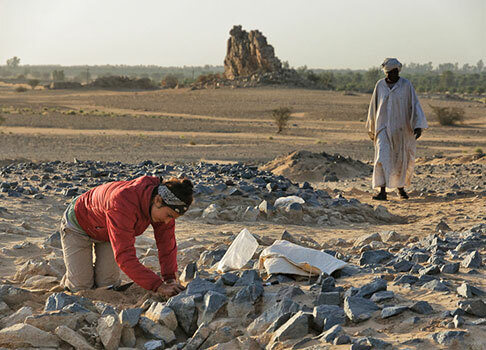 1400 x 500m in extent, excavations have revealed a long history of use. Dug into the earliest ground surface uncovered was a number of shallow oval graves, one of which contained a crouched inhumation, the body laid on a red ochre-coated leather hide. 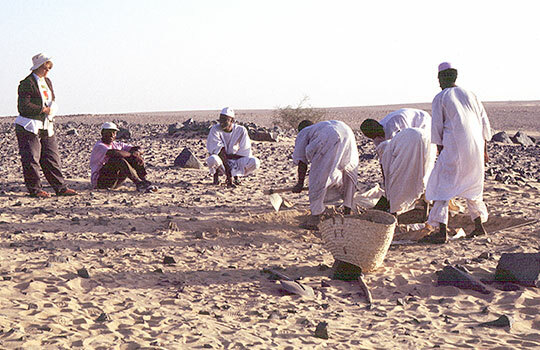 This style of burial is readily paralleled amongst Kerma graves elsewhere in the Nile Valley and the discovery of a large sherd of Kerma pottery from the cemetery suggests that it may have been used at that time. 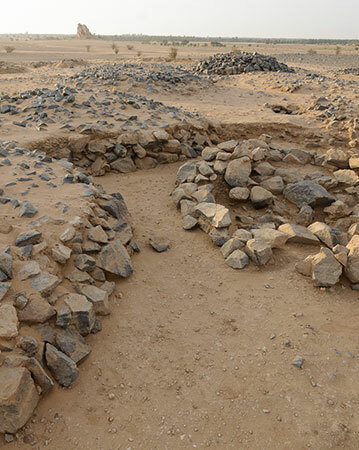 Tomb monuments were circular cairns of stone. 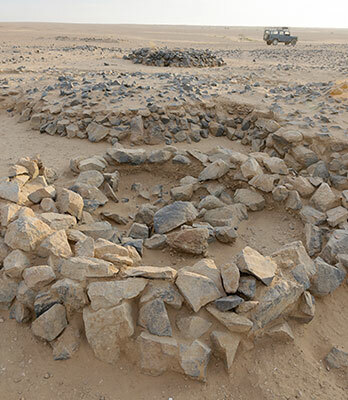 After a build-up of material up to 500mm further burials, of post-Meroitic date, were dug, again covered in prominent cairns of stone. The latest burials were those of Christians buried under typical stone box graves. Davies, W.V. 2003. ‘La frontière méridionale de l’Empire: Les Égyptiens à Kurgus’, Bulletin de la Societé Française d’Égyptologie 157, 23-37. Davies, W.V. 2005. ‘Egypt and Nubia. 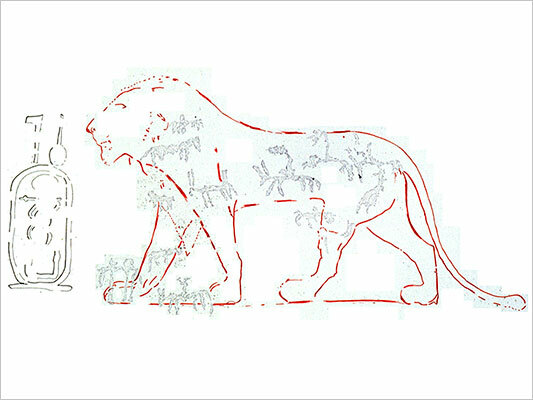 Conflict with the Kingdom of Kush’, in C. H. Roehrig (ed.) Hatshepsut. From Queen to Pharaoh. New Haven and London, 49-56. Davies, W.V. and I. Welsby Sjöström 1998-2002. 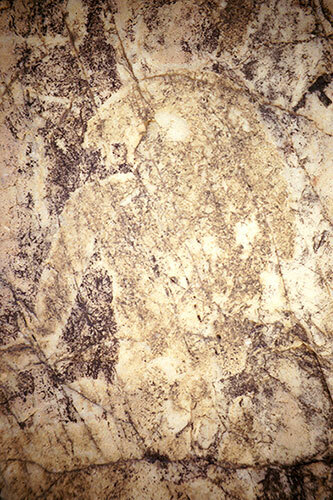 ‘Kurgus 1998: A Preliminary Survey’, Kush 18, 45-59.